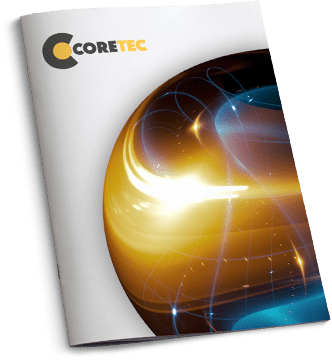 The Coretec Group, Inc.™ (Coretec) is a developer of technology-based solutions for application within a number of global markets, including energy storage, solid state lighting, printable electronics, microelectronics, solar energy, and 3D imaging within the medical, defense, and cyber security markets. The Company utilizes a patented IP materials portfolio, including its proprietary high volume liquid silicon precursor, Cyclohexasilane, Si6H12 (CHS), to commercialize technologies for energy-focused product applications. It also owns a proprietary 3D volumetric display technology called CSpace®, with applications within medical imaging, defense, cyber security, and entertainment. The Coretec Group is a new entity comprised of the 2016 merger of 3DIcon Corporation and Coretec Industries. The Company signed a supply agreement with Gelest, Inc., a leading manufacturer and supplier of silane, silicone and metal-organic specialty materials in December of 2016 for the pilot-scale manufacturing of the Company's high volume liquid silicon precursor, Cyclohexasilane, Si6H12 (CHS). The Company signed an exclusive licensing agreement with the North Dakota State University Research Foundation, providing access to an IP portfolio of silicon-based materials for development and commercialization.